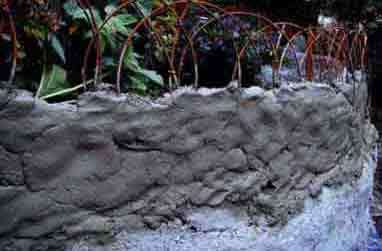 Cement wall section is hand molded in place and reinforced with wire rings. 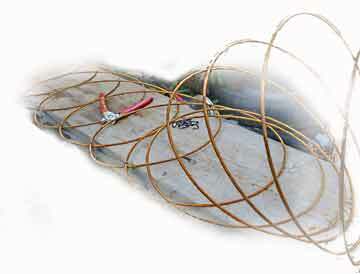 The flat spiral wire reinforcement configuration is much easier to use in a "tilt up" operation. 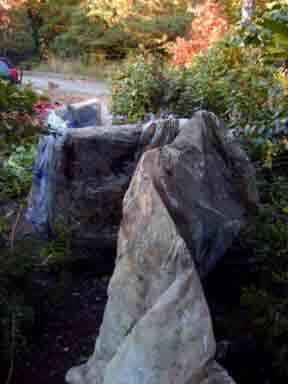 On thbis page it is hand molded in place to protect a previously existing garden. Using tilt up or heavy moving equipment was not an option here. For comparison, the easy way is shown here. (Pictures intentionally blurred for quick www downloading). Picture #1: Viewed from the lower end is a wall already under construction. It is being built on top of a very peculiar ferrocement foundation. 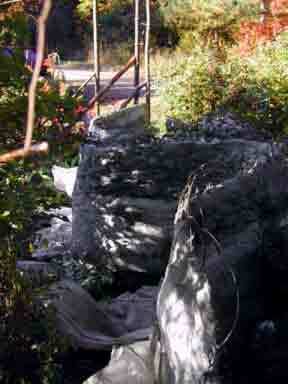 The foundation is rail like with piers sunken nearly 3.5 ft or a meter into the ground to protect against frost heaving. Picture #2: Viewed from the upper end is the foundation already built up with one tier of rings. Closer to the camera is a short section of foundation without the first tier. 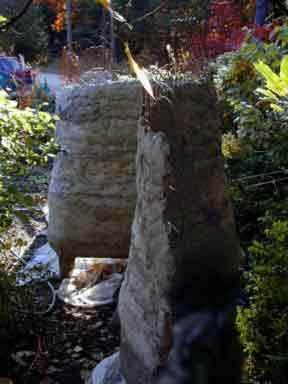 The rings are seen protruding from the top of the cement, ready to receive the next tier of rings. 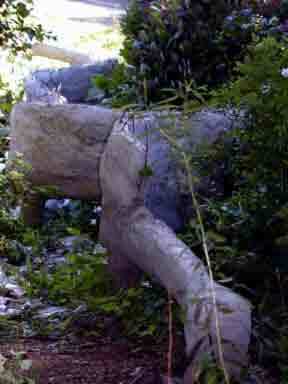 The very low slump concrete/ cement is placed with both hands, (gloved to avoid day long contact with wet cement). A variety of aggregate sizings were used. Picture #3: In this length of wall the wire reinforcement rings were a flat, continuous, spiral configuration. 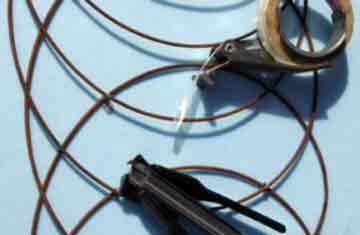 Small "C" shaped wire crimps or clamps were used to stabilize wires for cement, since no other molding support is used. The tool is shown. These fasteners are often called "hog rings" and can be found in agricultural, upholstery and fisherman supply outlets. Picture #4: Several tiers are now placed. Recycled plastic sheet is on the ground to catch "rebound", (cement which falls during application). Picture #5: The wall has raised by another tier. The recycled plastic is covering the wall for quick cure from solar heat. 1.5 parts sand, 1.5 gravel with stone to 1 part cement by weight. Picture #7 Close up of present rough finish, (picture taken in bright sunlight). Picture #8 Wall is over half the planned height. Barely visible is a tier of wire ready for cement. Picture #9: Alternative methods tried for rigidifying the flat spiral wire. Barely visible are little tabs of string tape which did work well. A hog ring dispenser was tried but did not work except where wire intersections were parallel instead of crossing like 90 degrees. The manual hog rings seemed to work best. Picture #10: View is from side near lower end. 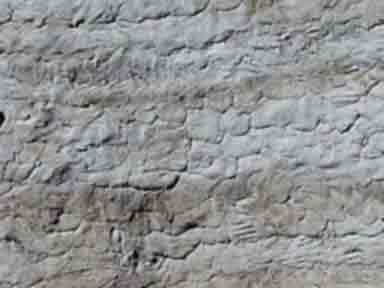 The length of this part of wall is about 30 ft and the height is near 9.5 ft. Previous picture taken from right side of this picture where wall is shaded. How long did this work take, once the work became routine? Time in man hours including the time spent mixing cement with corkscrew bit on drill. Each tier took about an hour to hand bend the wire to form the desired 1 ft diameter spiral ring size. Each tier took an hour to attach the spiraled wire to previous tier. Each tier took about 7 hours to place cement. All work was by hand, using low cost tools. The project is still underway at this writing, suspended due to cold weather. Computer and imaging time is also not counted, but many more hi res images are saved for a possible CD or www animation of this project. (Images on these pages have been intentionally down graded to travel quickly over the www). Click here for a report on the other section of connected wall using another form of ringforcement. Ringed tier construction is an option for construction where access is restricted. Steel reinforcement can be added in short tiers to allow hand access to both wall sides during construction. Ringed tessellations adapt well to contoured surfaces which do not accommodate flat mesh reinforcements. Tensile strength can easily be incorporated in ferrocement (or thin concrete) without dependence on steel to steel bonding. Overlapping reinforcement rings interlock the overall tensile strength through the intervening overlaps of compressive media, (concrete in this experiment). Production of other composite materials could benefit from ring reinforcement. While the diameter of the rings used here varied from10X to 20X the wall thickness, the ring diameters could practically vary from micro to macro and the materials also could vary from cement to any composite. Ringed particles or ringed parts "flow" together with less resistance to placement, thus easing any construction or manufacturing process. The present limitation is simply the lacking availability of mass produced ring products and a lack of technological priorities for improving (mass) ring production. A 3D Ring Matrix: Here is a link to some further developments with cell like reinforcement. External ringforcement ribbing on a dome. Original Ringforcement page, click here.